Since last Sunday was Easter, I took the day off from blogging (or scheduling a post), but glad to get back to this meme. It has been my favorite one to date. 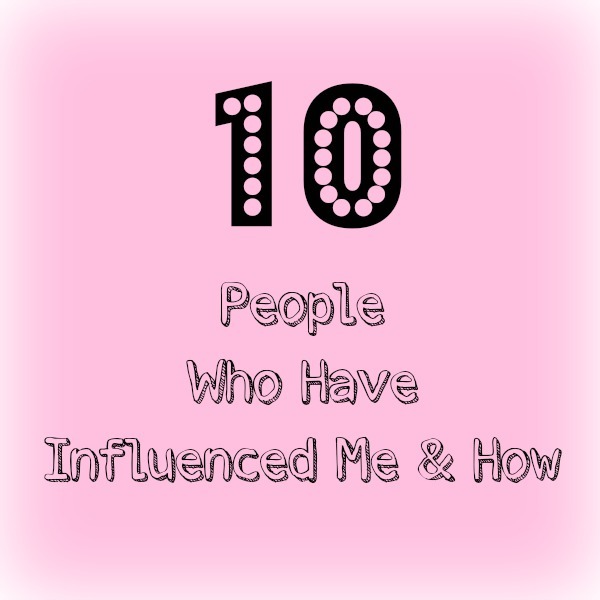 Today’s topic in the “30 Things I Want My Son To Know About Me” is, “10 people who have influenced me and how?” This topic is so easy… I have been so blessed with amazing people in my life. I knew the first time I met him that he was different than any man I had ever met before. Although he was shy and I was NOT, he helped me to think out of the box. He inspired me to get out of my comfort zone. Time and time again. His influence has made me a more well-rounded person. Greg is so intelligent and pushes me to learn even more. He took to fatherhood like a pro giving his all to me and our son. Our son is very lucky to have him as a father. I have the utmost respect for you, my dearest husband. I never would have thought a child could have had such an impact on me as my son. His influence has been monumental. He has taught me to be more accepting, to open up my heart and not be afraid to let people in. He teaches me to laugh more, loosen up, and have more fun. And this is an ongoing progress… I look forward to many more years of learning and being influenced by you, Cody. The woman I aspire to be. My Mom is the most giving person I know. She was a tough mom, teaching me that she was not my friend, but a parent first. After I became an adult, and to this day, my Mom is my best friend. Her influence has led me to be a parent to my son and hopefully one day, Cody will consider me among one of his best friends, too. You taught me how to give and not expect anything in return. I thank God every day that he gave me you, Mom. I am who I am today because of you. My step-dad, IS my dad. He taught me that you can love completely a child as your own even if they aren’t related by blood. He married my mom and accepted and loved my siblings and me with his entire being. We are his children and he is our Dad. His influence has helped me to be the person I am today. I know what a real dad is suppose to be like because of you. My baby brother has shown me what a real man and father looks like. He was in his early twenties when he took custody of his son (who had cerebral palsy) and raised him alone. Not many young men would have stepped up and done what he did. And he really did raise his son all by himself for the majority of my nephew’s life. You’re stubbornness and ability to not give up inspires me, Buddy. God brought an amazing woman into my life later in life. Teaching me that true friendship is possible no matter how old you get. Our children started out Kindergarten in the same class together and we connected right off the bat. It really was like an instant friendship… like I knew her all my life. Stacie and I have a lot in common and she makes me feel special just by being around her. It’s so easy being around her. I especially admire the mother she is to her children. She inspires me to be a better friend. Mrs. Curry was my 4th grade teacher and the first teacher I had that made me feel special. She opened up her home and her heart to me. She instilled in me a love of learning. From Kindergarten through 3rd grade I had only made As, but I did what I was suppose to. School was relatively easy for me, but Mrs. Curry inspired the LOVE of learning that is still in my today. In the summer of 1980 we moved and I was going to be attending a new high school for my junior and senior years. It was a tough time but I met this girl, Robin (who was actually the same age as my sister) and her sister, who ended up being in my homeroom (I also was very close to Karen) that lived down the road from us that summer. It helped when school started that I already knew and had become fast friends with these girls. Robin and I became great friends that summer and for many years to come, and even though I moved away, she and I are still friends 34 years later. Her influence still resonates with me today. Her kindness and openness and gentle soul makes me so proud and blessed to have had her friendship in my life. I met Mary in 1987 and we were friends from that day on. We worked near each other and had lunch together every day. And spent many of our weekends together, too. Mary taught me how to laugh with ease. She is one of the hardest working women I know, and inspired me to push myself. Although we don’t live near each other anymore, I know that she would be there for me if I needed her, if at all possible… and I hope she knows I would for her, too. My oldest best friend’s (Robin from above) mother was another woman in my life that taught me that I didn’t need to be a blood relation to love me like I was one of her own. Rosetta opened her heart to me giving me advice and her unconditional love for years. Sadly, Rosetta is no longer with us, and I think of her often. I am so blessed that she was a big part of my teen years, as well as my twenties. I’d like to share a quick story, one of the last times I saw her, actually…. when I was about 5 months pregnant I stopped by her house while I was in visiting my parents. I had a lot of trepidation about being pregnant, being very scared about having a child with something wrong with him, that it overwhelmed the first part of my pregnancy. Anyway, as I was leaving, she placed her hands on my belly and said a prayer. It was the most amazing feeling that came over me, and I knew without a doubt at that very moment, Cody would be perfect. I’ve realized in writing this list that I have had the most phenomenal male influences in my life and females that really represent what it is to be a good woman. I also realize that the lasting friendships I’ve made were instantaneous. What I mean is, as soon as I met these special women, it was as if I had known them all my life. Thank you all for loving me. Thank you God, for bringing them into my life! Who has influenced you most and how? Check back next Sunday when the topic will be, “Describe your most embarrassing moment”. Great post! I have to say my mom and my grandmom tops the list! Thanks for sharing this part of your life with us! This is a great post. My parents, grandparents and some very special friends have influenced me the most. Sounds like you have some wonderful people in your life. My sil currently inspires me. She is pregnant with her 7th baby and they’re all under 9. She never seems to lose patience with them and she homeschools and doesn’t usually get away from them by herself. I don’t know how she does it! Wow a wonderful list! It makes you realize just how many people we really have, if we think about it, in our lives who impacted us positively. This is a great post. I really need to sit down and write something like this. Your list of influences is spectacular! I know my grandmother, mother and children would certainly make my top ten.